A player purposely positions his golf bag so as to block the sunlight from where he is teeing his ball. If he then makes a stroke at his ball has he breached any Rule? Note: As the player was not in contact with the golf bag, he accepted protection from the elements in breach of Rule 14-2. Penalty: two strokes in stroke play or loss of hole in match play. 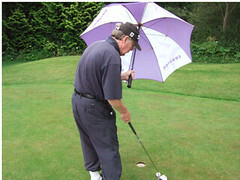 A player holds an umbrella, as shelter from wind and rain, with one hand and putts with the other. Is this permissible? Note: Unlike Question 1 the player has direct contact with the umbrella. Rule 14-2 does not prohibit a player from protecting himself from the elements. A player must not make a stroke while accepting physical assistance or protection from the elements.